Arrows. 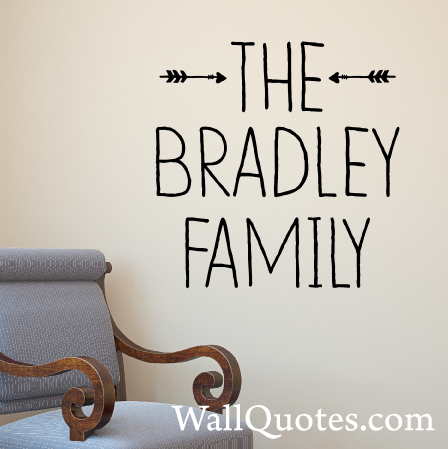 We're seeing them everywhere these days - on walls, on pillows, on prints, on furniture. And they're made of almost anything - pallets and Popsicle sticks and paint (just to name a few). They're adorable in a nursery and fashionably modern/rustic in grown up living spaces. I'm totally crushing on 'em. Here's a quick round up of easy (and a few slightly more complicated) ways to incorporate this fun, whimsical trend in your own home decor. 1. 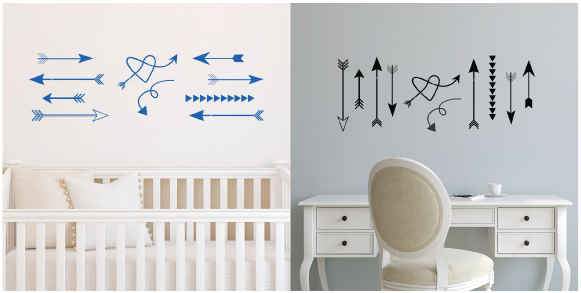 A whimsical arrow wall decal from WallQuotes.com makes a big impact, but is still affordable and easy to apply. Use a single set above a crib, changing table, console table, or desk as an accent, or for maximum impact, use multiple sets to cover an entire wall. 2. Bring on the texture and up the impact in the nursery by using this sweet arrow baby bedding (in mint, navy, or coral) from Caden Lane. Or, for the grown-ups (and mostly grown-ups), this duvet cover from Urban Outfitters will do the trick. 3. 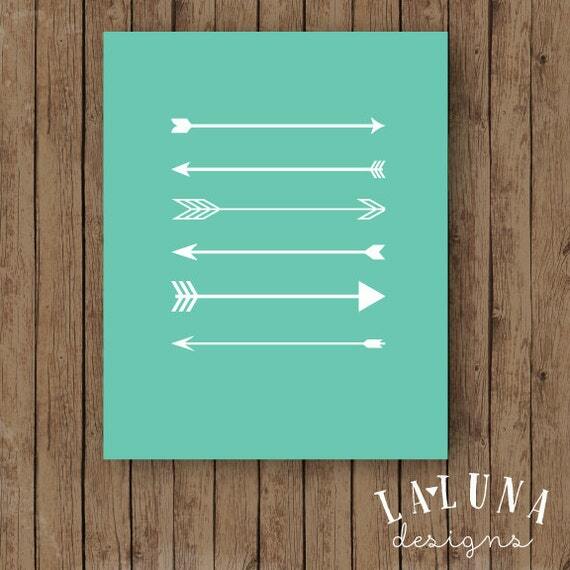 For a more subtle look, try a print like this one from LaLuna Designs on Etsy. 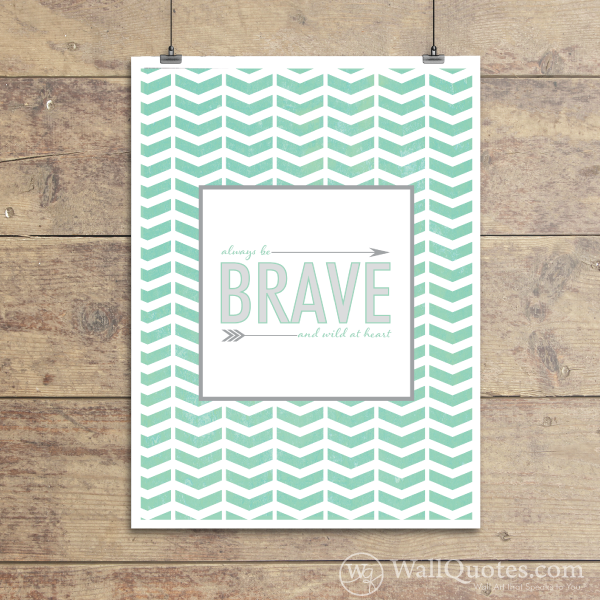 Or this arrow print from WallQuotes.com. Speaking of fabric - check out these arrow print fabrics from the Fat Quarter Shop here, here, and here. Coral - check. Aqaure - check. Even a little vintage vibe - check. I see window panels, pillow covers, even a little skirt? Oh, the possibilities. 5. And sure, it's rather easy to add arrows to kids' rooms - but check out this stylish arrow jewelry holder by Lemonade Makin' Mama. Best part? It's a $10 project. Woot. 6. Speaking of projects, why not make your own wooden arrows? 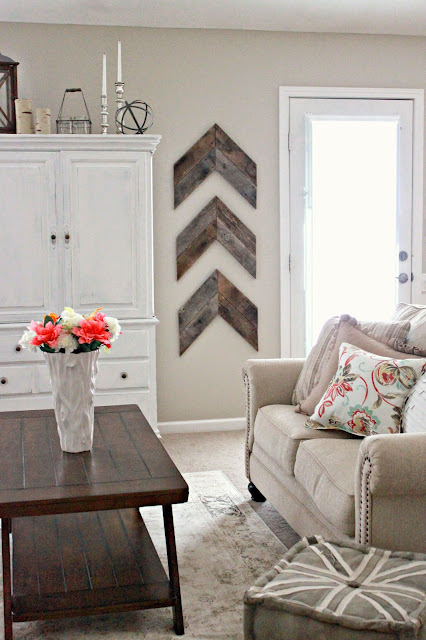 See what I mean - totally stylish and yet the perfect blend of modern and rustic here in Amanda's living room. Love. 7. Or, add a little arrow love with a vinyl decal from WallQuotes.com. We've got so many to choose from. My favorite? This arrow-inspired vinyl decal, hands down. It's got that modern/rustic feel going for it in spades (see what I did there?) I'd put it in an entryway. Or over a console table. Or, well, almost anywhere, really. And there you have it. 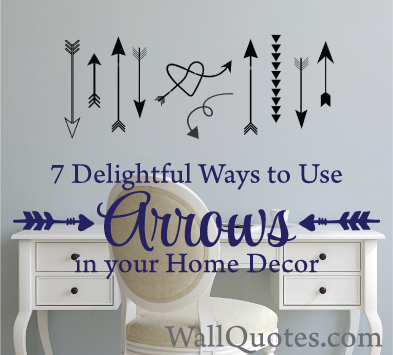 Seven relatively easy ways to add a little arrow whimsy to your home. Happy hunting! (ha! Did it again).